Deogracia Cornelio, UCLA Labor Occupational Safety and Health Program’s associate director of education, conducting heat illness prevention training in Los Angeles, California. Raquel Sanchez knows what it’s like to work day after day under the sweltering sun. Originally from Michoacán, Mexico, Sanchez spent her first seven years in the United States picking grapes, cherries and tomatoes for some of the largest growers in California’s Central Valley. When outdoor temperatures climb, workers who harvest food, build homes, deliver mail, tend gardens, or distribute goods may suffer serious health consequences. According to the federal Occupational Safety and Health Administration, nationwide exposure to environmental heat led to 37 work-related deaths and an estimated 2,830 injuries and illnesses that forced people to miss work in 2015, the latest year for which these statistics are available. And as climate change brings more frequent and severe heat events, the risks for people who work outdoors are only expected to increase. 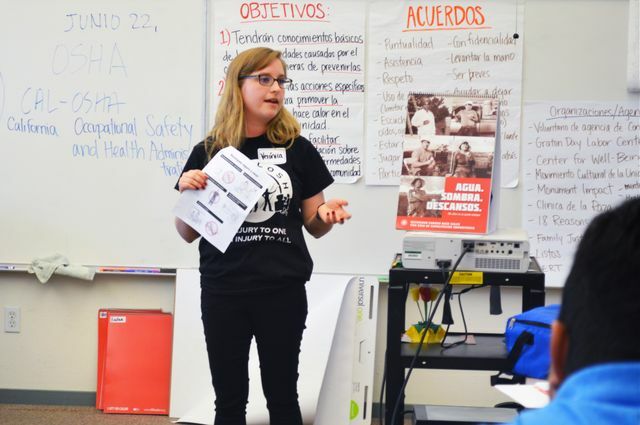 So when Sanchez, who now works as a community health promoter with Campesinas Unidas del Valle de San Joaquin, heard that she could attend a class sponsored by UCLA’s Labor Occupational Safety and Health Program, which goes by UCLA-LOSH, to learn to teach others to prevent heat illness, she jumped at the chance to participate. 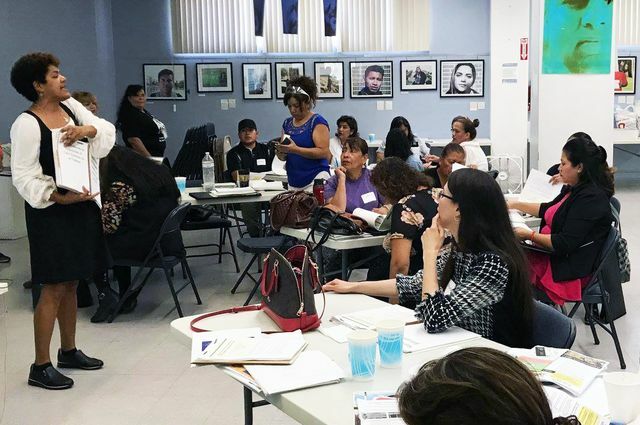 “This training initiative was a response to the continuing need for community-level education and capacity building to ensure workers have adequate heat protections,” said Linda Delp, director of UCLA-LOSH and adjunct associate professor in the UCLA Fielding School of Public Health. Part of UCLA’s Center for Occupational and Environmental Health and its Institute for Research on Labor and Employment, UCLA-LOSH is well-qualified to lead these efforts. The program has served as a safety and health resource for California workers since 1978, and it participated in a statewide heat illness prevention initiative from 2010–12, sponsored by the California Department of Industrial Relations. This summer’s courses, funded by grants from the National Institute of Environmental Health Sciences’ Worker Training Program and the California Commission on Health and Safety and Workers’ Compensation, were designed as training-of-trainers for community health promoters and worker-leaders like Sanchez. 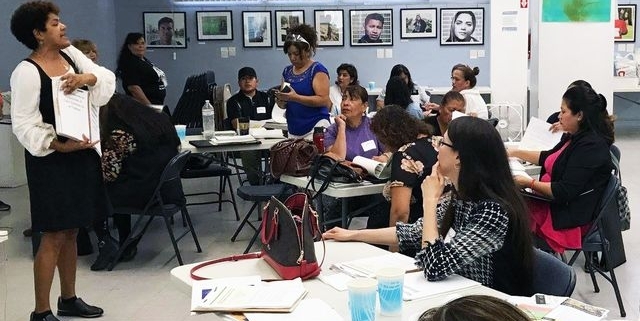 UCLA-LOSH staff partnered with colleagues at the UC Berkeley Labor Occupational Health Program and with local community-based organizations to host four day-long training sessions in Los Angeles, Santa Rosa, Porterville and Lindsay. Veronica Ponce de Leon leading a training session in Santa Rosa, California. The curriculum was designed to both raise awareness of heat as a hazard that particularly affects low-wage workers and vulnerable communities, and to develop participants’ education and advocacy skills, according to Deogracia Cornelio, UCLA-LOSH associate director of education who led the Los Angeles training session. Trainees learned about common signs and symptoms of heat illness, recommended preventive steps, and requirements of the California heat standard. They were then expected to carry out short education sessions with other members of their communities. The training sessions enrolled about 100 people who in turn have reached close to 600 others, including workers in agriculture, landscaping, construction, garment manufacturing, warehousing and other industries. While the four classes were conducted in Spanish, some participants have gone on to lead education activities in other languages, such as the indigenous Mexican languages of Mixteco and Triqui. Another participant, Jose Rojas, reflected on the importance of workers knowing the California requirements that employers provide water, shade and rest. Veronica Ponce de Leon, who facilitated three of the heat trainings for UCLA-LOSH, said that even though the conditions are getting hotter each year, the dangers of heat aren’t discussed enough. “The participants appreciated how we presented heat as a topic that everyone could relate to and that they could teach to others,” Ponce de Leon said. The people taking each class received handouts, training guides and other materials they could use in their education efforts, and they had the chance to practice their teaching skills throughout the day.